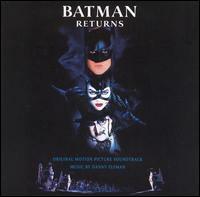 Batman Returns: Original Motion Picture Score is the score album for the 1992 film Batman Returns by Danny Elfman. The soundtrack also includes "Face to Face", written by Siouxsie and the Banshees and Elfman, used to promote the movie prior to its release. Two versions of the music video were made (the other added shots from the movie), and a club version, remixed by 808 State, was released. Elfman added chorus to the main theme making it similar but not as dark as the original. The soundtrack is studied by students in the UK taking their A-Levels. The titles for tracks 1–6, 10 and 11, 13 and 14, and 16–19 are not official titles, as they are suggested by the film music site Filmtracks. The album art combines those tracks respectively in pairs and lists them as "Birth of a Penguin" (Tracks 1 and 2), "The Lair" (3 and 4), "Selina Transforms" (5 and 6), "The Rise and Fall from Grace" (10 and 11), "Rooftops/Wild Ride" (13 and 14), "The Final Confrontation" (16 and 17) and "The Finale" (18 and 19). Online databases of the album usually list the tracks as parts "I and II" or with "Cont." in brackets. This titling prompted confusion from consumers, and was heavily criticized by Filmtracks. La-La Land Records released Danny Elfman's complete score to Batman Returns on November 30, 2010. ^ McDonald, Steven. "Danny Elfman: Batman Returns at AllMusic. Retrieved 15 September 2011. ^ "Batman Returns (Danny Elfman)". Filmtracks.com. 24 September 1996. Retrieved 15 September 2011. ^ "Batman Returns". musicfromthemovies.com. Retrieved 15 September 2011. ^ "Batman Returns - Danny Elfman". soundtrack-express.com. Archived from the original on 2011-07-23. Retrieved 15 September 2011. ^ Herzog, John (18 April 2001). "Batman Soundtrack". SoundtrackNet. Retrieved 15 September 2011. ^ "Filmtracks: Batman Returns (Danny Elfman)". ^ "Batman Returns: Limited Edition (2CD-Set)". Lalalandrecords.com. Archived from the original on 2010-12-17. Retrieved 2 January 2011. ^ "Batman Returns: Charts & Awards > Billboard Albums" at AllMusic. Retrieved 23 May 2010. This page was last edited on 21 March 2019, at 19:49 (UTC).